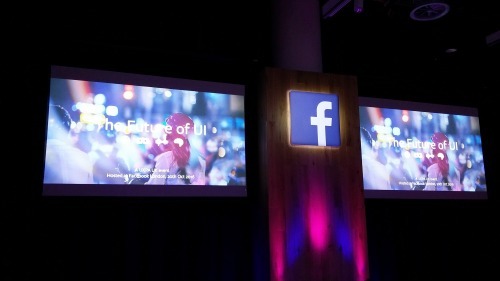 This months UXPA event was held at Facebook and featured four really great speakers all on the subject of The Future of UI. First up was Raz Schwartz who works on Virtual Reality (VR) at Oculus. His talk covered how to make immersive VR social. This is interesting as they are designing for two distinct audiences, one who is interested in VR and maybe already has the Oculus Rift headset and the other being people who have received a Gear headset with their new Samsung phone and had no real idea about VR before this. Raz talked about two important parts of social VR: Rooms and Avatars. Rooms gives people somewhere to meet and do activities. His team found having an actual room, rather than just space was important for people to really feel comfortable in the VR environment. But avatars are much more important as they show a persons perception of themselves. He found that the first question many users asked was 'what do I look like?'. They have put a lot of effort into making it easy for people to create their avatar and see what it looks like. The biggest question they had to solve was how to show a persons body without it looking weird. They ended up letting the users brain figure it out, which seems to work well. I have not tried VR yet so it was really interesting to get a sneak peak into what this world looks like. Next up was Dr Simone Stumpf from City University. She talked about Artificial Intelligence (AI) and how UX designers might be made redundant. As she said we all think of AI as Hal 9000 (from 2001: A Space Odyssey) or the Terminator, out to kill us, where in fact AI is already amongst us and if it kills us it will be due to a data decision centre making a mistake, for instance a health care programme giving an incorrect diagnosis. Simone said that the main problem is that users and designers do not understand how AI works which makes it hard to make the process transparent. We believe that transactions are rule based when really they are based on data analytics and complicated maths. And as we lose control we also trust these devices less. It is these problems which actually mean that UX designers will be needed more than ever, but she warned it will be very easy for us to be edged out of the process if we do not understand it well enough to design for. Our third speaker was Umesh Pandya from Wayfindr which is a company I have been interested in for a while now. They started in 2013 looking at how they could help visually impaired people move round the London Underground using beacons and their mobile phones; their main aim being to give visually impaired people more independence and confidence. This project has now been turned into a set of standards which companies can use to help visually impaired people move around not just the underground, but hospitals, shopping centres and anywhere else they might want to go just using off the shelf technology. Umesh said that this does not just help people move around but also changes their perception of their own ability. A powerful thing. And this does not just help visually impaired people but also print disabled people, those who maybe cannot read the signs due to it not being their first language - helpful for tourists then, or people with cognitive issues, for instance dyslexia. This is a really exciting project and I look forward to seeing how it moves forward. Our last speaker was J Paul Neeley, from Neeley Worldwide. He was speaking on speculative design which looks into the future for possible design ideas. This is not fantasy. It is about looking at all possibilities. Including the messy real people who might use it. He talked us through some examples which his students had come up with, including a car that could also be used for growing veg and a watch which showed travel times on its face. He likes to create artefacts from these design sessions and use them to engage people in discussion. This was the most challenging talk as it covered a subject I had not come across before and did not really go into how to use this method, however for a 20 minute talk it was certainly something to take away to look into further. It was a really interesting evening with a lot to consider. When you think about it we really are in the middle of history being made, which is pretty cool.